Yes, this is what greeted me when I opened my locker the other day at my golf club. I almost felt like a tour pro. 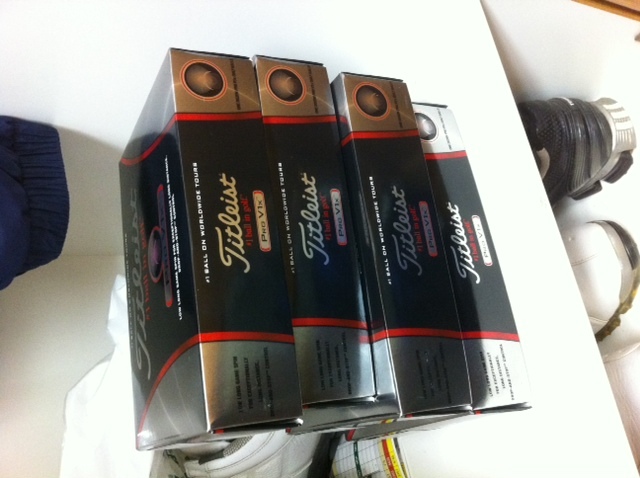 When this golf season began, I took advantage of the Titleist promotion in which you got a free dozen balls when you bought three dozen. I think this is such a genius promotion on the part of Titleist. Let’s be honest about something: Pro Vs are not cheap. While they cost much less than a driver or a wedge or a putter, they are still awfully expensive for something that is, essentially, disposable. The initial $40 price tag for a dozen was one thing, but that number has creeped north on a seemingly annual basis. Throw in tax and I’m not sure there are a lot of places where you can buy a dozen Pro V nuggets for under $50. But when you get a free dozen, that drops the average dozen price to somewhere in the low to mid $30s. That I can live with. While I get cheaper golf balls, I’m not the only winner. Titleist wins as well. How? Well, even for a golf addict like me, four dozen balls last a long time. That locks me up as a Titleist user for quite a while. That also means I’m far less likely to pick up a dozen of the new Callaway Hex Black Tour ball. Or the new version of the TaylorMade Penta. That’s a win for Titleist. While I still think the Pro V models are the best two balls on the market, the gap between Titleist and everybody else isn’t what it once was. So if you find one of these out there, let me know. I’d like it back. For the record, I went with the high numbered Pro V1x ball (balls are numbered 5, 6, 7 and 8 instead of 1-4). They say simply “JS” on the side in red. I’m hoping red letters = red numbers. 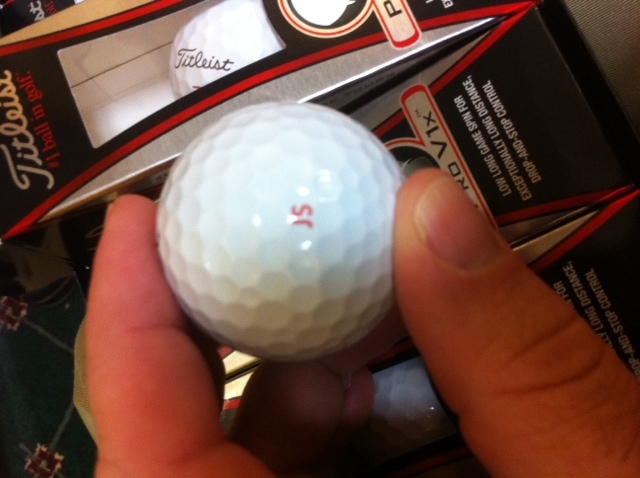 I haven’t had personalized golf balls before, but it was part of the deal. I’m expecting to see a lot of personalized balls at my club. Our pro said that more of our members took part in the promotion than any other club in Minnesota.